New Winter 2018: Congratulate your favorite darts enthusiast for their fantastic aim with a winners cup trophy personalized just for them. 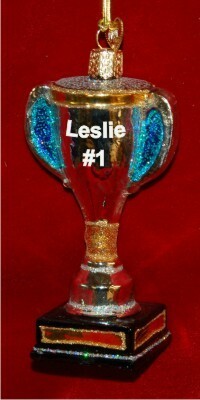 The darts trophy personalized ornament will glitter in gold and blue wherever it is displayed, and with the hand-painted information in a handsome font, this personalized hobby trophy will delight the recipient. Send the information, and we’ll produce a customized hobby or sports trophy personalized for an athlete, hobbyist, friend or family member on your gift list who is a winner in any field. The dart player personalized Christmas ornament is beautifully crafted with bright, sparkling finishes that will shine throughout the holiday season.